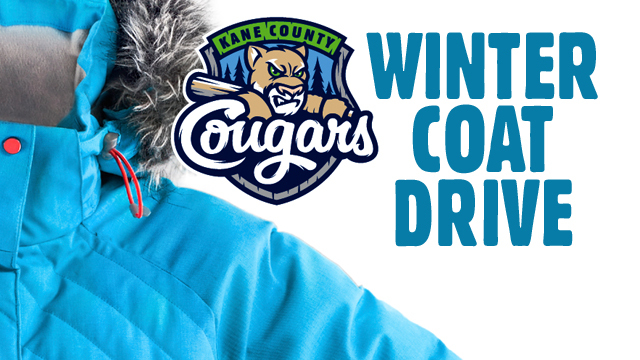 GENEVA, Ill. - The Kane County Cougars have announced the dates for the organization's annual Winter Coat Drive. Beginning Monday, December 3 fans are welcome to drop by the Cougars front office located at Northwestern Medicine Field (34W002 Cherry Lane, Geneva, IL 60134) week days between 9 a.m. and 4 p.m. to donate winter coats for those in need this holiday season. Donations of new or gently-used winter coats for infants, children and adults are all encouraged. Fans will receive one (1) undated reserved seat ticket voucher valid for a 2019 regular season Cougars game with each donated item. There is a maximum of 15 complimentary ticket vouchers per fan. In partnership with the Midwest Shelter for Homeless Veterans, all donated coats will be given to local families and individuals in need of cold-weather outerwear this winter. The Cougars are requesting that all gently-used winter coats be donated by Friday, December 14 at 4 p.m.
For more information, contact the Cougars front office at 630-232-8811. Ticket packages for the 2019 season are now on sale including the Cougars Christmas Pack. From now until December 31, purchase the Christmas Pack for just $89 and you'll receive four (4) box seat ticket vouchers valid for any game during the 2018 season, one (1) general lot parking pass, $60 in Cougars cash plus two (2) reserved seat ticket voucher for Opening Night on Thursday, April 4. That's a savings of over 40% which makes it the perfect gift for the baseball fan on your shopping list this holiday season. Visit kccougars.com for more information or to purchase your Christmas Pack today.